Zoom in on the academic skills students are required to learn in reading, writing, speaking/listening, and language! This book cuts through all of the Common Core jargon and gets right to the heart of what students need to learn now. 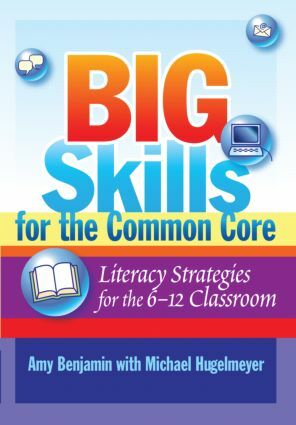 Big Skills for the Common Core is packed with engaging strategies you can use immediately to improve your students' literacy skills and help them retain those skills. Charts that break down the skills for each anchor standard and put them into teacher- friendly language. BONUS! The charts highlight the big shifts for teachers for discussion and sharing. Practical strategies to help students tackle and understand complex texts. Helpful ideas for teaching argument writing, plus writing rubrics and assessment strategies. Clear information on Tier II and Tier III words and how to teach them. In addition, each section of the book ends with "Classroom Close-Ups," which take you inside real classrooms that are implementing the Common Core. You'll see the standards in action across the curriculum and get takeaway tips you can use tomorrow in your own classroom! Creating a Writing Culture: What Do Students Need?